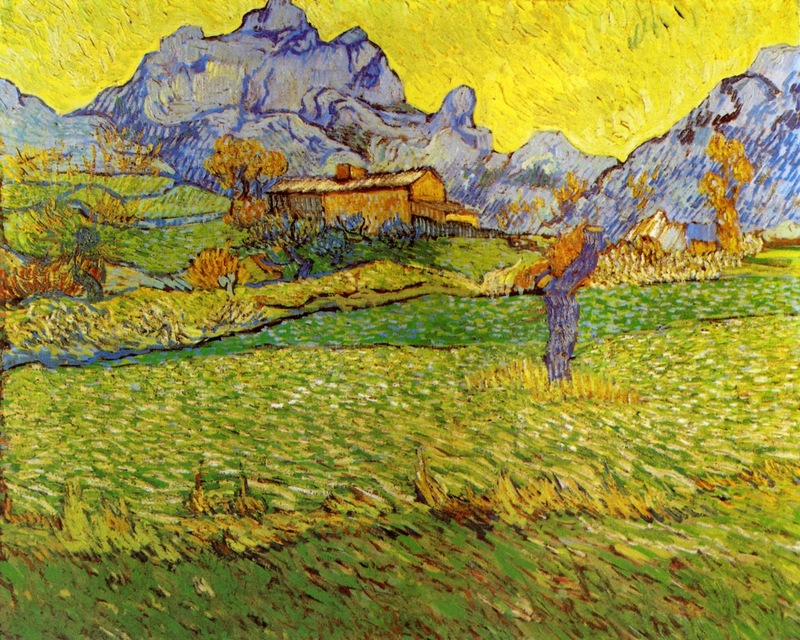 This is my revamp acrylic painting of Van Gogh’s original painting “A Meadow in the Mountains: Le Mas de Saint Paul”. 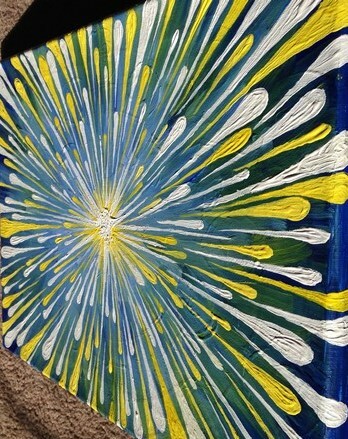 I call my painting (above) based on Van Gogh’s original piece: “Multidimensional Portals in Van Gogh’s Hyperspace”. Below is a picture of Gogh’s original painting. Depicted in both of our paintings are heavily colored pallets, defined brush strokes that converge into shapes resembling mountains, a barn, shrubbery, a meadow, a rather crudely shaped stream, and a brilliant sunset/ sunrise. 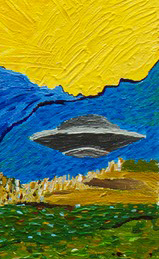 My painting includes a UFO off to the side, floating ominously. Hence the title to my painting. Meanwhile, Gogh’s painting features more shrubbery and contrasting colors in some areas. I emulated Van Gogh’s painting style which has been called impasto. Impasto paintings consist of very, very thick and copious amounts of paint placed blob by blob on top of or next to eachother until a desired appearance is achieved. 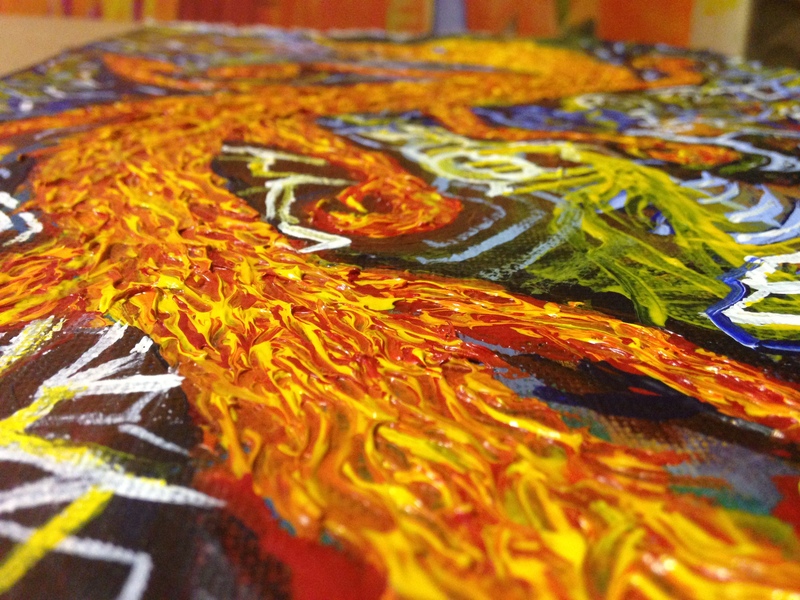 Impasto paintings are often highly textural in appearance. I also used a photograph of Van Gogh’s original painting as a reference for creating my own. Parts of this painting came to be quite systematically while others, like the sky, seemed to flow from out of me with no effort and lots of joy. The movement in the sky and in parts of the meadow reflect how I was feeling as I made them: joyful, energized, free. Click the image above, the details will really stand out! This piece made me feel like during parts of its creation I was merely a vessel for which the creation took place through me. It was as if the essence or spirit of Van Gogh was working through me in some areas. Of course, this could merely be a coincidental, natural phenomenon in which I was enjoying creating art. However, that is not a feeling I often acquire when making art and it is definitely not something I can do on demand. So..perhaps I should try something like this again in the future. This is a graphite drawing on a piece of paper that is 9 by 12 inches. Depicted is what I consider to be a beautiful, attractive, young woman in a pose which captured my artistic attention. I found a photograph of this girl in my travels and wanted to present her beauty in my own creative way. This drawing is a result of such, and I used the photograph I found as a reference. I also am creating more graphite, realism pieces like this lately because I believe they will strengthen my artistic skill and capabilities. It’s not really my niche to work solely in realism, but I do think it will teach me something about artistic discipline as I continue to create more realistic pieces like this. Like all my portrait drawings, I start the piece with a basic outline of the subject I am drawing. I don’t have a photo of this piece’s outline, but here is an old photograph of a piece that is currently in progress. This gives you an idea of what the basic outlines I start with look like. Here’s another example of a basic outline..
After the outline, I get to work on the shape of the face and usually try to pick one part of the face to focus on for a bit before working all over the piece. This gives me a more accurate foundation for me to base my details on. Now that I’m fairly satisfied with the face I begin to shade below it. Now that I’ve nearly finished shading, I take some time to darken some areas and smooth out the shading. I also manage to bend the paper…lucky me, especially during the final stages in this piece’s creation. Ah well. I don’t get too worked up about mistakes anymore. Every artwork I’ve made is essentially a compilation of mistakes I eventually deemed adequate. You can quote me on that. In fact, I will quote myself on that. This piece was one of those pieces that wasn’t exactly easy nor too challenging. There will be more to come. Thanks for reading! This is a 9×12 inch colored pencil drawing on a piece of paper. Depicted is an abstract representation of a temple. It appears to be composed of gems and technological surfaces. I used vivid colors tried to stick to shapes with a futuristic aesthetic while maintaining an ancient touch to the pyramid like structure in the center of the piece. I wanted to make something vertically symmetric and aesthetically pleasing, but I also wanted it to have an esoteric touch to its appearance. I wanted to create something that appeared both sacredly futuristic and ancient at the same time. I wanted to create something that appeared holy or spiritual but that would appeal to people of any religious/spiritual stance. It’s a similar idea to the painting above I have initiated that is a work in progress. Like most of my pieces, I start this one off with a rough graphite sketch of the basic outline. I start with a pyramid shape, adding a column on the left side, all while keeping in mind the symmetric nature of this piece. So, I know everything I do on the left side of the drawing must be reflected on the right side. I refine some of the details and add a few more. By now I’m done with most of the details. Now I’m about to trace over the graphite with ink. Now that I’ve traced over the graphite details in ink I erase the entire paper to remove any trace of graphite. This is important as graphite and colored pencil don’t mix well and often create an ugly appearance. Depicted is a portrait of Nikola Tesla surrounded by blue lightning. 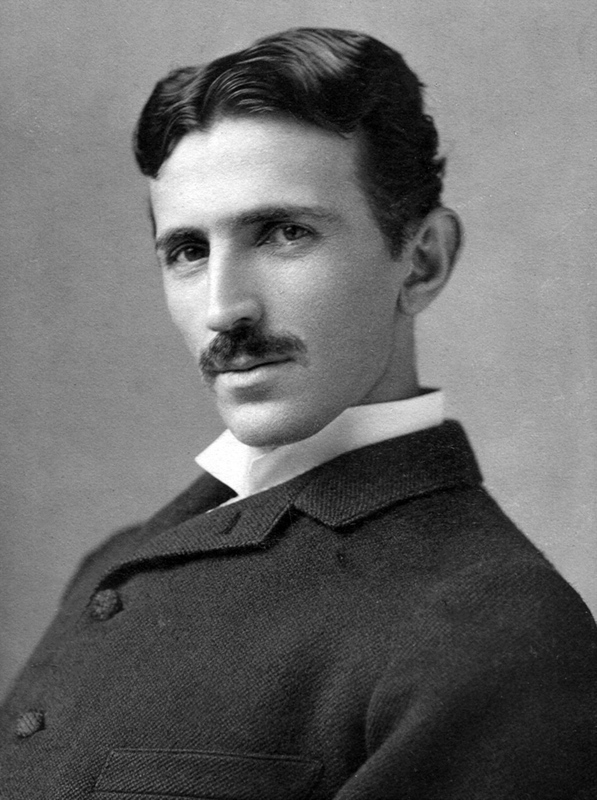 Tesla was a total genius who was a master of understanding electricity, engineering, physics and more. I based the drawing off this photograph of Tesla. I wanted to make it look like he was emanating powerful, dynamic energy. I wanted to make an artwork that would give people something intellectually substantial to study. That “something” is Nikola Tesla and his works of genius. Tesla, not Edison, is the true father of electricity and he pioneered the field in numerous, amazing ways. I highly encourage anyone who is even remotely interested in Tesla and his work to do their own research on the topic. I start the drawing with a very basic outline of Tesla. I then add some facial details. Focusing on the eyes or any particular part of the face gives me a good foundation to base the rest of the details around. I finish up the rest of the details. After I’m satisfied with the graphite part of this drawing, I erase the graphite where I want the electricity to be and add the lightning effect using blue colored pencils. Finally, I darken some areas, mostly his suit. Being that this is a portrait in my series of inspiring people, there will definitely be more pieces like this. So far, I have in this series Terence Mckenna, Alan Watts, and Steve Jobs. I had fun making this piece, the excitement of watching a piece of paper go from being completely blank to looking like a living being is hard to come by. Thanks for reading! If you’re interested, this drawing is available as prints, posters, and other merchandise available here. This is an acrylic painting on a 16×20 inch piece of canvas pad. Depicted is a symmetric, geometric painting of various shapes, lines, and gems. In the very center of the painting there is a tiny blue portal. It’s not that the portal is actually tiny, just that it’s farthest away from the viewer’s perspective. The alien, synthetic, technological appearance is symbolic of the new paradigm I acknowledge our species is creating and immersing itself in. I call it “Paradigm Portal” for this reason. I wanted to create something synthetic looking. I wanted something symmetric and aesthetically pleasing and I wanted to make something close to my painting “Consciousness Storage Device”. You can see how the color themes and visual ideas from this previous painting influenced the making of “Paradigm Portal”. The detailed line work is almost the same shape and color scheme, even the background copper tones of concentric circles leading into a blue center carried over into the more recent painting. I even used the same reflective copper paint. I also wanted to mix things up a bit and add some of the new skills I learned from my painting “Suspended Enigma” into this painting. As you can see, I took the swirly, spherical white and blue orbs from “Suspended Enigma” and painted them into “Paradigm Portal”. I did’t just stick to orbs though, I used the same technique to make oval shaped gems on the edge of the painting as well as the much larger blue and white sections on the sides of the more recent painting. I started this piece by creating a graphite cross. 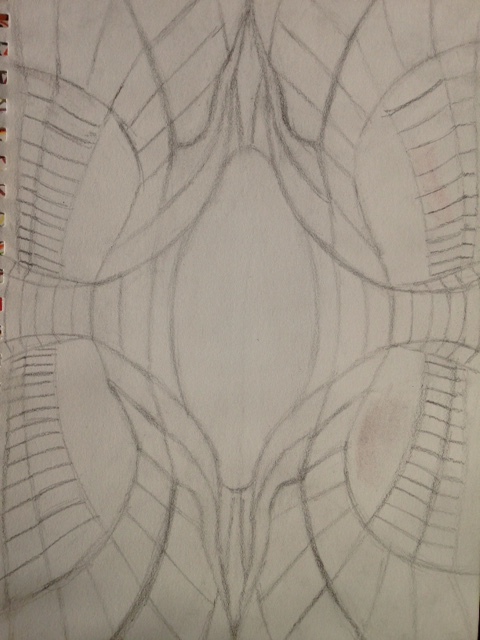 This is the foundation of the artwork and allow for me to create the symmetric effect much easier. I then draw the outline of the artwork in grahphite. I build up bit by bit, starting with a few basic shapes and expanding as I continue to maintain a symmetric appearance. Eventually my graphte outline is complete and I’m ready to start applying acrylic paint. 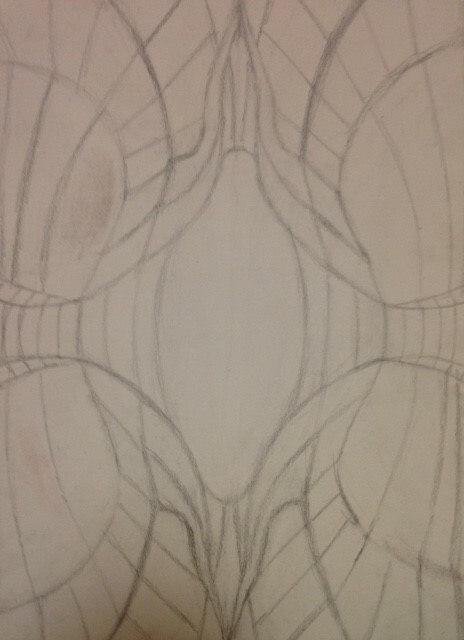 Because graphite on canvas pad tends to smear easily I paint part of the outline with black paint. Next, I start filling in the shapes and shading them. Fill in the background and use a graphite pencil directly on the paper to create an outline for some of my line details.. In this photo you can see how the background copper paint shimmers and shines. Thanks for reading! If you’d like to see purchasing options for this piece, click here. This is an acrylic painting on a 9×12 inch piece of paper. Depicted is a gem in the center. Surrounding this gem is a colorful grid like pattern or field. I wanted to make a piece that would be creative and cool looking. I wanted it to appear like a pleasant machine as opposed to an industrial, cold steel machine. 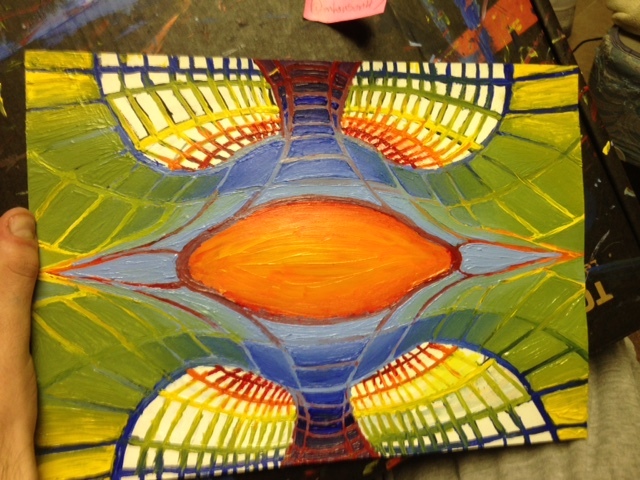 Another painting of the cybernetic field. I also wanted to create an imaginary device. A device that would create a field of energy around it when activated. I call this field the cybernetic field. I imagine that, like the internet, data is sent and received to different areas within the field. I imagined a type of field that would make it possible to send dreams, feelings, memories, and thoughts to other people interacting with the field. A being integrating within the cybernetic field. This field may serve as a metaphor for the internet. The internet may actually someday acquire the ability to transfer experiential information. This has amazing implications for the future. Humans would be able to learn at incredible rates if they could transfer their past experiences over the internet to be downloaded by someone and experienced in real time. Someone interacting with the cybernetic field. Some scientists theorize it will be entirely possible to record our dreams and re-experience them again after waking. Many also believe that memories can be recorded and transferred to other beings who never experienced them. 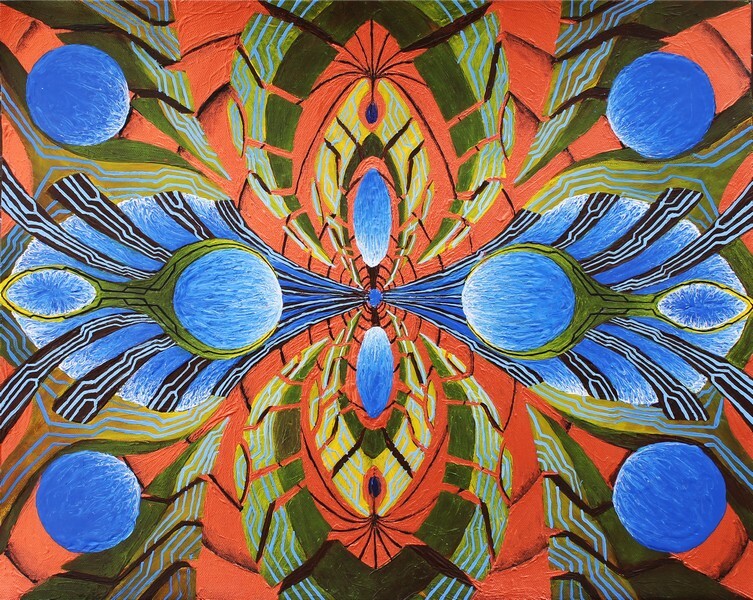 My paintings of the cybernetic field depict a metaphorical template for such experiences to be transferred between beings. Another being becoming absorbed into the cybernetic field. Because I find this topic fascinating, I am considering creating an article pertaining to it in the future. I suppose what fueled this creation was a craving for novelty and expression. I had some cool, possible ideas about the future and created this. I was also bored and wanted something to do. This painting started as a drawing in the back of a car on my way back from Old Orchard Beach, a family vacation spot. 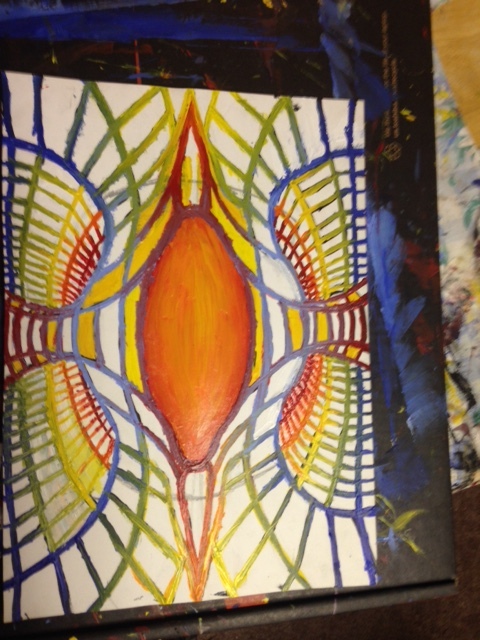 I started this creation by first drawing the oval shape that is the gem in the center of the painting. From there I expanded details towards the edges. Next, I add more detail to the drawing’s outline. After this, I paint the gem and start the painting process of the grid outline with black paint. This makes it so that when painting lighter colors I have to apply less layers. Now, colors for the outline. I like colors. I crave them sometimes. I place colors that I know will blend well next to each other. colors. colors.colors. Now I fill in the white boxes. This piece was fun and easy, with the exception of coordinating the colors in the correct spots so that they would blend well together. Filling in the boxes was surprisingly difficult, perhaps I should have started with the boxed colors first and added the lines after. Thanks for reading! If you’d like to see purchasing options for this piece including prints, posters, and other merchandise you may do so by clicking here. If you’re on a computer purchasing links are found below the image. If using a mobile device you must scroll down to view these links. 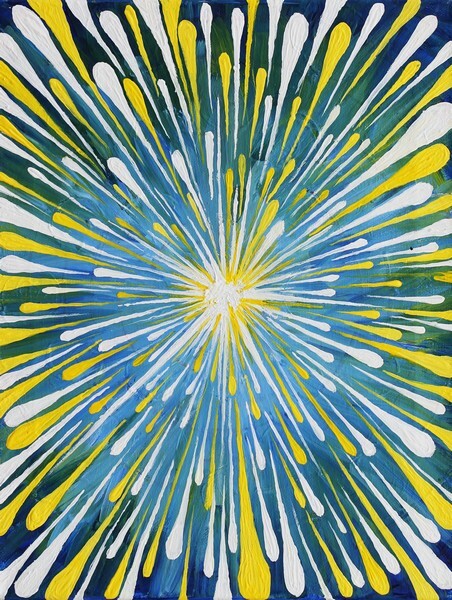 Yellow and white beams protrude from the center of the painting, expanding outwards. It was a fun piece and an experiment with perspective. I made this piece at the beggining of a wave of creativity. Towards this painting’s completion, I had many new creative ideas for new paintings and drawings. This piece expressed how I felt in an artistic sense. This piece is a symbol of climax and the birth of novelty. Many people see different things when they look at it, I find this amusing. I am repeatedly reminded of the subjective nature of art when people propose an observation relative to a perspective I had not yet considered. I’ve found that people enjoy this piece from some angles of perspective more than others. This is an interesting spectacle to me that raises interest on the subject and consideration into my future projects. For example, the image above is met with more appreciation on social media than the image at the top of this article. Not only is this painting an artwork, it has served as a social experiment on visual perspective. I started with the background. The center was light blue and I worked from there towards the edges, gradually adding darker blue and streaks of green. After allowing the background to dry, I created white ball in the center. 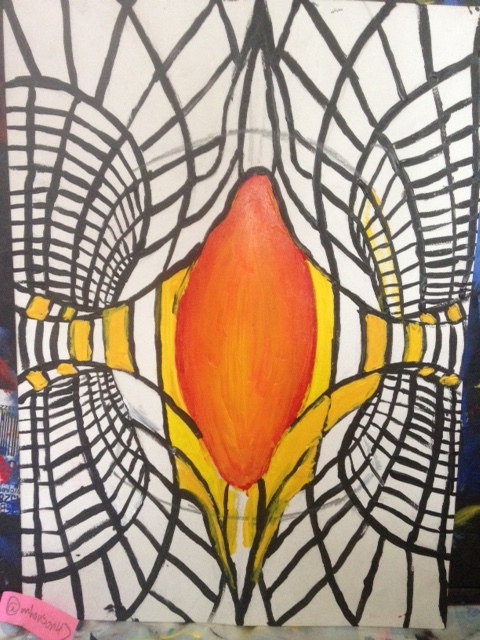 I started adding streaks of white and yellow protruding from the ball, continuing until the ball was no longer a ball. Eventually I had the illusion of radiance. I continued adding beams of yellow and white, making sure to create the illusion of different layers of space by separating the center “light” from some of the expanding beams. On the beams which appeared closer to the perspective of the viewer I added rounded ends. This gave these beams the effect of moving away from the center in an outwards direction. I wonder what the end result would have looked like had I not decided to round the ends of those rays. This was a piece that came naturally to me and that I enjoyed making with little effort. It reminds me a bit of my other painting “Spacetime Expansion“. I may return to this style again, although I see no reason to in the near future. Thank you for reading! If you’d like to see availability of the original painting or prints/posters you may do so by clicking here.